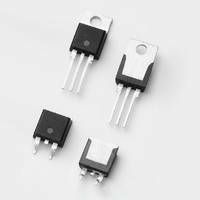 Available in TO-220R and TO-263 packages, S8016xA Series SCR Switching Thyristors feature an RMS on-state current (IT(RMS)) up to 25 A. Units are used as input rectification of AC line inputs for electric vehicle on-board and off-board chargers. Offering maximum repetitive off-stage voltage (VDRM) of 800V, thyristors are suitable for use with Level 1 and Level 2 AC charging applications. Units are designed with VDSM and IPP of 1300V and 2400A respectively. The S8016xA Series is available in either TO-220R packages in quantities of 500, with 50 per tube or in TO‑263 (D²-Pak) packaging in quantities of 500 in an embossed carrier reel pack. Sample requests may be placed through authorized Littelfuse distributors worldwide. For a listing of Littelfuse distributors, please visit Littelfuse.com.